Due to the cumulative nature of medical research, some of the information in this statement is likely to be out of date. For more current information on this and other health topics, please visit MedlinePlus, a service of the U.S. National Library of Medicine, National Institutes of Health. Celiac disease is an immune-mediated disorder that affects primarily the gastrointestinal tract. It is characterized by chronic inflammation of the small intestinal mucosa that may result in atrophy of intestinal villi, malabsorption, and a variety of clinical manifestations, which may begin in either childhood or adult life. Intestinal symptoms can include diarrhea, abdominal cramping, pain, and distention, and untreated celiac disease may lead to vitamin and mineral deficiencies, osteoporosis, and other extraintestinal problems. Considerable scientific progress has been made in understanding celiac disease and in preventing or curing its manifestations by dietary interventions. There is a strong genetic predisposition to celiac disease, with the major risk attributed to the specific genetic markers known as HLA-DQ2 and HLA-DQ8 that are present in affected individuals. Dietary proteins present in wheat, barley, and rye, commonly known as glutens, interact with these HLA molecules to activate an abnormal mucosal immune response and induce tissue damage. 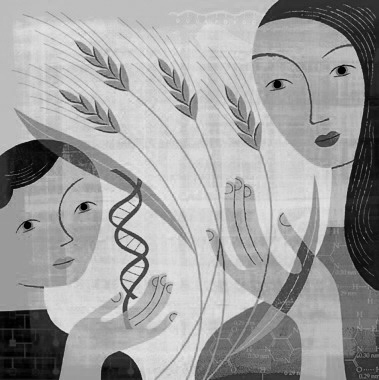 Most affected individuals experience remission after excluding gluten from their diet. Celiac disease has been considered until recently to be a rare disease in the United States. Studies, primarily in Europe but also in the United States, now suggest that its prevalence is much greater than previous estimates, possibly affecting as many as 3 million Americans (roughly 1 percent of the U.S. population), indicating that the disease is widely underrecognized. Recent identification of the autoantigens involved in celiac disease has led to the development of new serologic diagnostic tests, but the appropriate use of these new testing strategies has not been well defined. These tests are identifying many individuals with nonclassical gastrointestinal and extraintestinal symptoms. As a result of these new developments, and in order to improve awareness, diagnosis, and management of celiac disease, the National Institutes of Health (NIH) convened a Consensus Development Conference on Celiac Disease on June 28ï¿½30, 2004. The National Institute of Diabetes and Digestive and Kidney Diseases (NIDDK) and the Office of Medical Applications of Research (OMAR) of the NIH were the primary sponsors of this meeting. The U.S. Food and Drug Administration, the U.S. Department of Agriculture, the National Institute of Child Health and Human Development, the National Cancer Institute, and the National Institute of Allergy and Infectious Diseases were the cosponsors. The Agency for Healthcare Research and Quality (AHRQ) supported the NIH Consensus Development Conference on Celiac Disease through its Evidence-based Practice Center (EPC) program. Under contract to the AHRQ, the University of Ottawa EPC developed the systematic review and analysis that served as a reference for discussion at the conference. The National Library of Medicine in collaboration with the University of Ottawa EPC conducted the literature search for the systematic review. What are the recommendations for future research on celiac disease and related conditions? On the final day of the conference, the panel chairperson read the draft statement to the conference audience and invited comments and questions. A press conference followed to allow the panel and chairperson to respond to questions from the media. 1. How is celiac disease diagnosed? The single most important step in diagnosing celiac disease is to first consider the disorder by recognizing its myriad clinical features. There is no one test that can definitively diagnose or exclude celiac disease in every individual. Just as there is a clinical spectrum of celiac disease, there is also a continuum of laboratory and histopathologic results. The combination of clinical and laboratory features may result in a diagnosis of celiac disease. All diagnostic tests need to be performed while the patient is on a gluten-containing diet. The first step in pursuing a diagnosis of celiac disease is a serologic test. Based on very high sensitivities and specificities, the best available tests are the IgA antihuman tissue transglutaminase (TTG) and IgA endomysial antibody immunofluorescence (EMA) tests that appear to have equivalent diagnostic accuracy (TTG is the specific protein that is identified by the IgA-EMA). Antigliadin antibody (AGA) tests are no longer routinely recommended because of their lower sensitivity and specificity. Serologic testing for celiac disease in children less than 5 years of age may be less reliable and requires further study. Biopsies of the proximal small bowel are indicated in individuals with a positive celiac disease antibody test, except those with biopsy-proven dermatitis herpetiformis. Endoscopic evaluation without biopsies is inadequate to confirm or exclude a diagnosis since endoscopic findings are not sufficiently sensitive for celiac disease. Multiple biopsies should be obtained because the histologic changes may be focal. Biopsies should be obtained from the second portion of the duodenum or beyond. The pathology report should specify the degree of crypt hyperplasia and villous atrophy as well as assess the number of intraepithelial lymphocytes. Some degree of villous atrophy is considered necessary to confirm a diagnosis of celiac disease. The finding of intraepithelial lymphocytes with crypt hyperplasia without villous blunting is less definitive. Standardization of the pathology reports in celiac disease is desirable, using published criteria such as modified Marsh criteria (1999). Communication between the pathologist and the individualï¿½s physician is encouraged to help correlate the biopsy findings with laboratory results and clinical features. Second opinions on biopsy interpretation may be sought when biopsy results are discordant with serologic markers or clinical findings. With concordant positive serology and biopsy results, a presumptive diagnosis of celiac disease can be made. Definitive diagnosis is confirmed when symptoms resolve subsequently with a gluten-free diet. A demonstration of normalized histology following a gluten-free diet is no longer required for a definitive diagnosis of celiac disease. In an individual with suggestive symptoms and a negative serology test, three scenarios are possible. First, the individual may have selective IgA deficiency. If an IgA deficiency is identified, an IgG-TTG or IgG-EMA test should be performed. Second, the serologic test may be a ï¿½false negative,ï¿½ and if this is suspected the test could be repeated, an alternative serologic test could be conducted, and/or a small intestinal biopsy could be performed. Third, the patient may not have celiac disease. When the diagnosis of celiac disease is uncertain because of indeterminate results, testing for certain genetic markers (HLA haplotypes) can stratify individuals to high or low risk for celiac disease. Greater than 97 percent of celiac disease individuals have the DQ2 and/or DQ8 marker, compared to about 40 percent of the general population. Therefore, an individual negative for DQ2 or DQ8 is extremely unlikely to have celiac disease (high negative predictive value). Patient preferences should be elicited in developing recommendations in the setting of a positive celiac disease serology and normal biopsy results. A single best approach cannot be prescribed. Choices include additional small bowel biopsies, periodic monitoring with celiac disease serology tests, or a trial of gluten-free diet. 2. How prevalent is celiac disease? Advances in the understanding of the multisystem nature of celiac disease and the identification of sensitive serologic tests have led to the recognition that celiac disease is much more common than previously thought. Population-based studies in the United States using various combinations of serological testing and small intestinal biopsy suggest that the prevalence of celiac disease is in the range of 0.5 to 1.0 percent, similar to estimates in Europe. These prevalence figures include both symptomatic and asymptomatic individuals. Certain ethnic groups may be at lower risk than Caucasians, but little is known about variation in prevalence among ethnic groups in the United States, a topic needing further study. Certain populations have an increased prevalence of celiac disease. First-degree relatives of individuals with biopsy-proven celiac disease have a prevalence between 4 and 12 percent of villous atrophy on biopsy. Second-degree relatives also appear to have an increased prevalence, although this has been defined only by serology. People with type 1 diabetes mellitus have a prevalence of biopsy-confirmed celiac disease ranging from 3 to 8 percent. Individuals with Down syndrome have a prevalence of celiac disease ranging from 5 to 12 percent. Celiac disease also is associated with Turner syndrome, Williams syndrome, selective IgA deficiency, and autoimmune disorders. 3. What are the manifestations and long-term consequences of celiac disease? Celiac disease traditionally has been defined as a gastrointestinal malabsorptive disorder that can present early in childhood after the introduction of gluten. It is now recognized, however, that the clinical manifestations are highly variable, may present at any age, and involve multiple organ systems. Prolonged delays in diagnosis are common. Since celiac disease is a multisystem disorder, the clinical presentation is highly variable. Gastrointestinal manifestations may include diarrhea, weight loss, failure to grow, vomiting, abdominal pain, bloating and distension, anorexia, and constipation. The presence of obesity does not exclude the diagnosis. It is very common for celiac disease to present with extraintestinal manifestations, sometimes with little or no gastrointestinal symptoms. A distinctive example is dermatitis herpetiformis, an intensely pruritic rash on the extensor surfaces of the extremities. Iron deficiency anemia is common and may be the only presenting sign. Other presentations are unexplained short stature, delayed puberty, infertility, recurrent fetal loss, osteoporosis, vitamin deficiencies, fatigue, protein calorie malnutrition, recurrent aphthous stomatitis, elevated transaminases, and dental enamel hypoplasia. Celiac disease may also be associated with an autoimmune endocrinologic disorder such as thyroiditis. In addition, a variety of neuropsychiatric conditions such as depression, anxiety, peripheral neuropathy, ataxia, epilepsy with or without cerebral calcifications, and migraine headaches have been reported in individuals with celiac disease. Classical celiac disease is dominated by symptoms and sequelae of gastrointestinal malabsorption. The diagnosis is established by serological testing, biopsy evidence of villous atrophy, and improvement of symptoms on a gluten-free diet. Celiac disease with atypical symptoms is characterized by few or no gastrointestinal symptoms, and extraintestinal manifestations predominate. Recognition of atypical features of celiac disease is responsible for much of the increased prevalence, and now may be the most common presentation. As with classical celiac disease, the diagnosis is established by serologic testing, biopsy evidence of villous atrophy, and improvement of symptoms on a gluten-free diet. Silent celiac disease refers to individuals who are asymptomatic but have a positive serologic test and villous atrophy on biopsy. These individuals usually are detected via screening of high-risk individuals, or villous atrophy occasionally may be detected by endoscopy and biopsy conducted for another reason. Latent celiac disease is defined by a positive serology but no villous atrophy on biopsy. These individuals are asymptomatic, but later may develop symptoms and/or histologic changes. The complications of celiac disease typically occur after many years of disease and usually are observed in adults. Refractory celiac disease refers to persistence of symptoms and intestinal inflammation despite a gluten-free diet. This may occur in the context of ulcerative jejunitis, or it may be an early manifestation of intestinal lymphoma. Most studies report an increased risk of non-Hodgkin lymphoma in celiac disease, but often do not distinguish between the classic celiac associated lymphoma (enteropathy associated T-cell lymphoma [EATL]) and other subtypes. EATL occurs primarily in people diagnosed during adulthood. Even with this increased risk, however, intestinal lymphoma is a very rare complication. Some evidence suggests that a gluten-free diet may reduce lymphoma risk. There is an increased risk of adenocarcinoma of the small intestine and some evidence that there may be an increased risk of carcinoma elsewhere in the gastrointestinal tract. All-cause mortality among those with clinically diagnosed celiac disease is about two times that of control populations. 4. Who should be tested for celiac disease? Individuals with gastrointestinal symptoms, including chronic diarrhea, malabsorption, weight loss, and abdominal distention, should be tested for celiac disease. Because celiac disease is a multisystem disorder, physicians should be aware of other conditions for which celiac disease testing should be considered. Individuals without other explanations for signs and symptoms such as persistent elevations of transaminases, short stature, delayed puberty, iron-deficiency anemia, recurrent fetal loss, and infertility should be tested. Other conditions for which celiac disease testing may be considered include irritable bowel syndrome, persistent aphthous stomatitis, autoimmune diseases, peripheral neuropathy, cerebellar ataxia, and dental enamel hypoplasia. Although individuals with celiac disease often present with osteoporosis, data do not indicate a significantly increased prevalence of celiac disease in the general population of people with osteoporosis. There are many other associated systemic symptoms that are not specific to celiac disease but for which celiac disease testing might be considered. There are a number of populations at higher risk for celiac disease. These include individuals with type 1 diabetes mellitus, other autoimmune endocrinopathies, first- and second-degree relatives of individuals with celiac disease, and individuals with Turner syndrome. Individuals and physicians should be aware of the increased prevalence of celiac disease in these groups. Symptomatic individuals in these populations should be tested for celiac disease; for example, an individual with type 1 diabetes mellitus and unexplained hypoglycemia merits testing. Because current data do not indicate a clear outcome benefit for early detection and treatment of asymptomatic individuals in these groups, routine screening cannot be recommended at this time, but individual discussions regarding the benefits and consequences of testing are warranted. Other populations at increased risk for celiac disease include individuals with Down syndrome and Williams syndrome. When individuals in these groups are unable to describe symptoms, screening may be appropriate and should be offered. At this time, there are insufficient data to recommend screening of the general population for celiac disease. For individuals who have been placed on a gluten-free diet without an appropriate diagnostic evaluation, testing should follow a gluten challenge. For those who decline to undergo a gluten challenge, the absence of DQ2 and DQ8 by HLA typing may help exclude the diagnosis. Resolution of symptoms on a gluten-free diet is not sufficient to diagnose celiac disease; however, there are no adverse nutritional outcomes associated with a carefully planned gluten-free diet. 5. What is the management of celiac disease? Treatment for celiac disease should begin only after a complete diagnostic evaluation including serology and biopsy. The management of celiac disease is a gluten-free diet for life. A gluten-free diet is defined as one that excludes wheat, rye, and barley. These dietary grains contain the peptides or glutens known to cause celiac disease. Even small quantities of gluten may be harmful. Oats appear to be safe for use by most individuals with celiac disease, but their practical inclusion in a gluten-free diet is limited by potential contamination with gluten during processing. The strict definition of a gluten-free diet remains controversial due to the lack of an accurate method to detect gluten in food products and the lack of scientific evidence for what constitutes a safe amount of gluten ingestion. Learning about celiac disease and how to identify gluten-containing products is associated with improved self-management. Participation in an advocacy group is also an effective means of promoting adherence to a gluten-free diet and may provide emotional and social support. Health care providers should consider and treat vitamin and mineral deficiencies, including iron, calcium, phosphorus, folate, B12, and fat-soluble vitamins. Individuals with newly diagnosed celiac disease should undergo screening for osteoporosis given the higher prevalence in this population. It is important to have a team-based approach to management. In addition to treatment by a physician and participation in a local advocacy group, consultation with a skilled dietitian is essential. Following initial diagnosis and treatment, individuals should return for periodic visits with the physician and dietitian to assess symptoms and dietary adherence and monitor for complications. In children, this includes evaluation of growth and development. During these visits, health care providers can reinforce the benefits of adhering to a strict gluten-free diet for life. Repeat serologic testing may be used to assess response to treatment but is unproven. These tests may take a prolonged time (up to 1 year) to normalize, especially in adults, and may not correlate with improved histology. Persistent elevated serological levels may suggest lack of adherence to a gluten-free diet or unintended gluten ingestion. Individuals who do not respond to a gluten-free diet require reevaluation. No established approach exists to screen for complications of celiac disease including lymphoma and adenocarcinoma of the small bowel. 6. What are the recommendations for future research on celiac disease and related conditions? Conduct a cohort study to determine the natural history of untreated celiac disease, especially ï¿½silentï¿½ celiac disease. Determine the response to gluten peptides in DQ2+/DQ8+ individuals without celiac disease. Determine which factors prevent disease. Identify which factors are involved in the induction of celiac disease in genetically susceptible individuals. Develop an animal model(s) of celiac disease that can be used to dissect pathogenic mechanisms. Determine prevalence of celiac disease in ethnic groups in the United States. Research prevention of celiac disease, e.g., timing of introduction of cereals in infants coupled to assessment of immune response (B-cell and T-cell) to glutens. Define the relationship between celiac disease and autoimmune and neuropsychiatric disorders. Identify non-HLA genetic modifiers that influence severity or phenotype of celiac disease. Develop noninvasive methodology to detect and quantify activity of celiac disease. Define the minimum safe exposure threshold of gluten in the diet relative to celiac disease. Develop alternatives to a gluten-free diet. Analyze the performance and cost effectiveness of serologic testing for celiac disease in the general population. Conduct research into screening methods for adenocarcinoma and lymphoma. Analyze the benefit of screening high-risk groups relevant to clinically important outcomes. Investigate the health-economic consequences of celiac disease. Identify and validate serologic assays for celiac disease diagnosis in young children. Investigate the quality of life of individuals with celiac disease. Celiac disease is an immune-mediated intestinal disorder with protean manifestations. Celiac disease is common, affecting 0.5 to 1.0 percent of the general population of the United States, but is greatly underdiagnosed. There are now specific and sensitive serologic tests available to aid in diagnosis that need to be more widely applied. The treatment of celiac disease remains a lifelong gluten-free diet, which results in remission for most individuals. The classic presentation of diarrhea and malabsorption is less common, and atypical and silent presentations are increasing. Most individuals are being seen by primary care providers and a broad range of specialists. Therefore, heightened awareness of this disease is imperative. Education of physicians, registered dietitians, and other health providers is needed. Education of physicians, dietitians, nurses, and the public about celiac disease by a trans-National Institutes of Health (NIH) initiative, to be led by the National Institute of Diabetes and Digestive and Kidney Diseases (NIDDK), in association with the Centers for Disease Control and Prevention. Standardization of serologic tests and pathologic criteria for the diagnosis of celiac disease. Adoption of a standard definition of a gluten-free diet based on objective evidence such as that being developed by the American Dietetic Association. Development of an adequate testing procedure for gluten in foods and definition of standards for gluten-free foods in the United States to lay the foundation for rational food labeling. Formation of a federation of celiac disease societies, celiac disease interest groups, individuals with celiac disease and their families, physicians, dietitians, and other health care providers for the advancement of education, research, and advocacy for individuals with celiac disease. Steven J. Bernstein, M.D., M.P.H. John F. Johanson, M.D., M.Sc. Crohnï¿½s and Colitis Foundation of America, Inc.
Marian J. Rewers, M.D., Ph.D.
Frank A. Hamilton, M.D., M.P.H. Van S. Hubbard, M.D., Ph.D.
Lester M. Crawford Jr., D.V.M., Ph.D.
Ann M. Veneman, J.D., M.S. Andrew C. von Eschenbach, M.D.